The next generation in multihull designs by Craig Schionning - the Spirited 380. Taking Kit catamarans to an exciting new level, using moulded hulls & decks combined with precision CNC-cut flat panels designed specifically for the DIY amature builder. 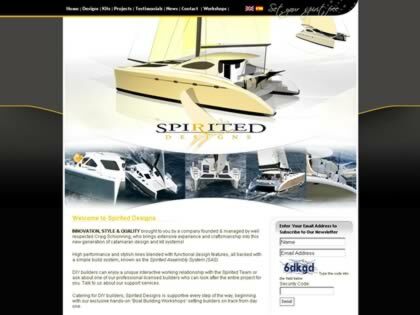 Web Site Snapshot: If available, above is a snapshot of the Spirited Designs web site at http://www.spiriteddesigns.com.au as it appeared when this site was added to the directory or last verified. Please Note that Boat Design Net has no involvement with the above web site; all content and images depicted in the above thumbnail are the property and copyright of Spirited Designs unless otherwise noted on that site. Description: The next generation in multihull designs by Craig Schionning - the Spirited 380. Taking Kit catamarans to an exciting new level, using moulded hulls & decks combined with precision CNC-cut flat panels designed specifically for the DIY amature builder.